Judith A. Kjelstrom, aka "Dr. Judy," director emerita of the Biotechnology Program and recipient of the Academic Federation’s James H. Meyer Distinguished Achievement Award for 2018. The James H. Meyer Distinguished Achievement Award will be presented at a dinner, 6-8 p.m. Tuesday, Nov. 6, in the Vanderhoef Studio Theatre, Mondavi Center for the Performing Arts. This is an invite-only event (registration deadline Oct. 30). For more information, send an email to Cindy Smith in Ceremonies and Special Events. The Meyer award is the UC Davis Academic Federation’s highest honor, given annually to one of its members for a distinguished career of achievement in his or her federation role as well as service to the campus and community. “Dr. Kjelstrom has worked tirelessly to promote the development of a robust and diverse biotechnology sector that will provide a route to prosperity for all communities in the greater Sacramento region,” said her nominators, including Mark Winey, dean of the College of Biological Sciences; and Cameron Carter, professor, Department of Psychiatry and Behavioral Sciences, who was interim vice chancellor of the Office of Research at the time of the nomination. Amrit Kaur Sahota and her mentor, Dr. Judy, in a UC Davis promotional photo from 2013. Kjelstrom retired in June after nearly 20 years as a lecturer and academic coordinator. Those are among the job titles that fall under the realm of the Academic Federation, which also takes in such titles as adjunct professor and adjunct instructor, agronomist, professional researcher and project scientist, academic administrator, librarian and program coordinator. She served the campus in other capacities, as well, for example, 10 years on both the Regents Scholarship Administrative Advisory Committee and the Biological Safety Administrative Advisory Committee, and as a member of the federation’s executive council. Kjelstrom’s association with UC Davis actually began more than 45 years ago when she completed an internship in clinical laboratory science here in 1972-73. She did this after earning a Bachelor of Science degree in biological sciences at California State University, Sacramento, becoming a first-generation college graduate. Done with her internship, she started a career that included working as a clinical chemist at UC Davis Medical Center and as a clinical microbiologist at Belleville Memorial Hospital in Illinois. In 1986, she returned to UC Davis to pursue a doctorate in microbiology in the laboratory of Professor Blaine L. Beaman in the School of Medicine. After completing her Ph.D. in 1992, she served as an adjunct professor of biology at Cosumnes River, Sierra College and American River community colleges, and Sacramento State over the next five years. She returned to UC Davis for good in 1998 as a lecturer in biological sciences, teaching Biology 1A (“Cellular and Molecular Biology”) for 300 to 500 students. One year later, “a job made in heaven” came along — associate director of the Biotechnology Program, home of the newly approved Designated Emphasis in Biotechnology, or DEB, graduate program. Before long, “DEB” became a coveted notation on doctoral student diplomas. “I thought we should all be talking together — basic science and engineering researchers, clinicians, industry and government agencies,” she said. The DEB graduate program brought academia and industry together by having industry-focused seminars and requiring DEB graduate students to complete three- to six-month internships with biotechnology companies. Over time, DEB grew in popularity, from 10 graduate students in 1999 to nearly 240 today, along with more than 200 affiliated faculty members. “We are similar to a start-up that has grown to a mature company,” said Kjelstrom, who became the program director in 2004. Talking biotechnology: Graduate student Amanda Dang, left and Kjelstrom in December 2017. Kjelstrom did not limit her mentoring to graduate students. “Any student who knocked on my door and asked for guidance, I would help them,” she said. She’s also involved in e-mentoring with high school students in biotech academies. She said she is humbled by being selected for the Meyer award. “I am an Aggie — I bleed blue and gold,” she said. “This award for distinguished service is the highest honor for an Academic Federation member.” And while it might be “the icing on the cake,” she has more cake to bake. Last year she partnered with the Graduate School of Management to develop a new course, MGT 290, “Biotechnology Industry Immersion,” bringing together Ph.D. and MBA students to tackle innovation challenges in biotechnology. 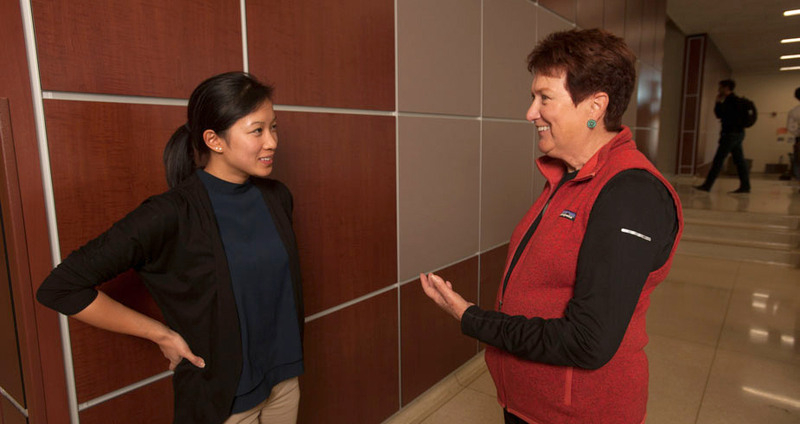 She taught it for the first-time last winter and will teach it again this winter — this time with her new title of “director emerita” of the Biotechnology Program and GSM academic coordinator. In another endeavor to promote science literacy, she is a board member and chair of the education committee for Sacramento’s Powerhouse Science Center on the Riverfront. It is expected to open in the fall of 2020. They said her distinguished service record reflects a passion for STEM education, her natural business acumen and desire to see new technologies have a positive impact on the world.